You know what today is not about me nor is really about the problems I have being cynical and too realistic about life. Today this post is about my mum. Just last month my family celebrated the glorious woman that is my mother. After losing my father a few months back, my mum really has been the strongest person in this whole mess. I know everyone thinks they have the best, greatest mother in the world but it really doesn’t matter. I think all mum’s rule the school; no matter how corny that sounds. One of things that make me admire my mum is her ability to wear a smile. Even on days where the life seems over whelming and hard, my mum has the biggest smile on her face. She might not be as young however the smile she wears is just as wide and warming as the ones in photographs from 30 years ago. While she is not a fan of hiding your emotions or bottling them up like I do, her ability to make other feel better with her smile is otherworldly. It is like a super power! For anyone in distress, she will swoop in save you from your swap of worries with her caring arms. Even the strangers in the street cannot help but be drawn to her vibrant personality like a super charged magnet. I can go on and on about my mum however being a procrastinator I have piled up a bunch of assignments from school. So as I leave you with this cake I made for her birthday. I want you to go to your mum and think about what her super power is. After give her a big hug and kiss randomly and out of the blue. She may think you are being weird but I know it will warm her heart. For those who are separated by distance or their mum has departed this world; I am sure thinking about them (only them!) for a solid minute or two will be enough. 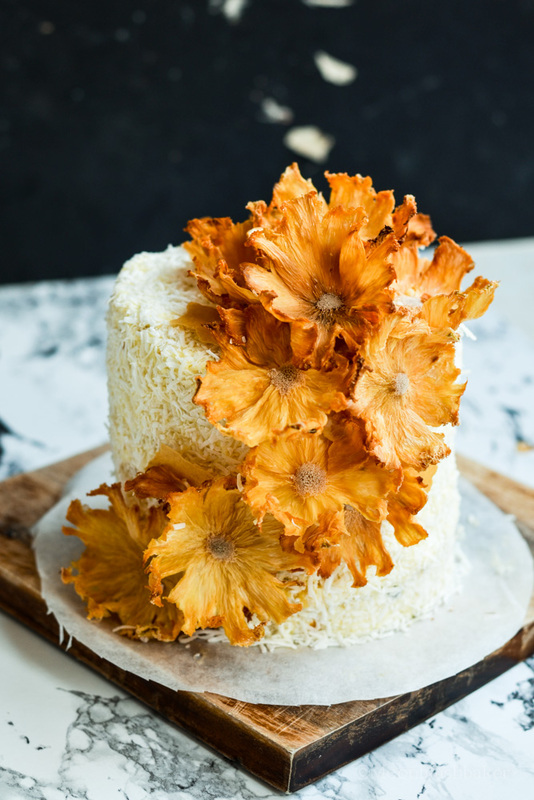 This cake is light, fragrant and very traditional in the best possible way. 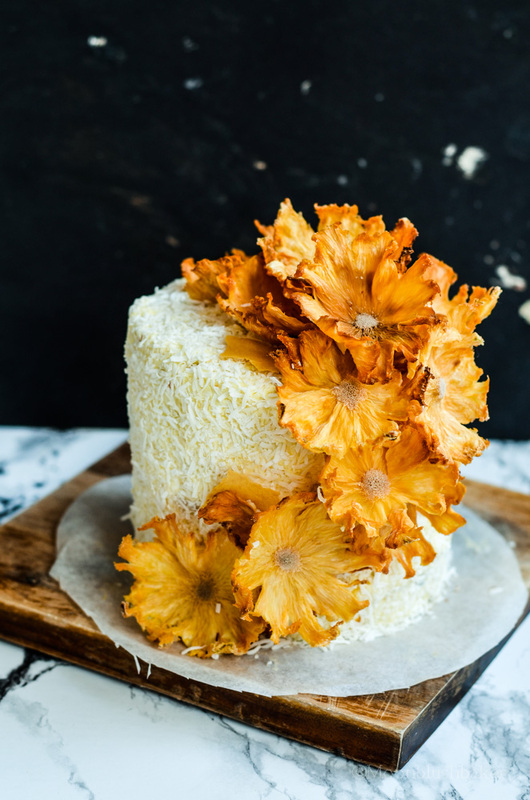 I was not trying to make this cake vegan but I am sure this is best recipe for a yellow cake when you are missing out on eggs. 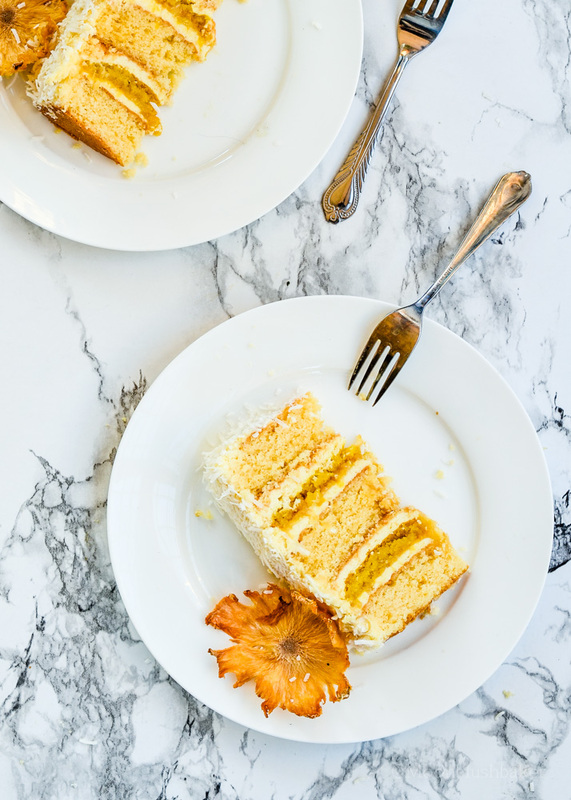 The buttery texture of traditional yellow cakes is recreated by the chemical reaction created by using vinegar and bi carb soda. Also it help to shift well, as this contributes to the even texture in the cake. 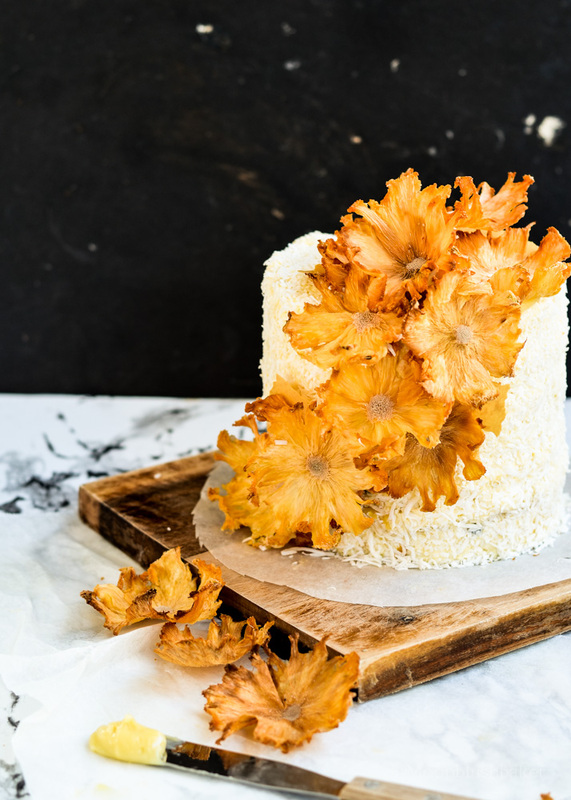 While the concept of flowers may be considered formal and reserved; by using the technique of drying out pineapple brings a modern twist to the cake. Be careful not burn it! The use of passion fruit curd and coconut is my way of recreating summer in the middle of winter. 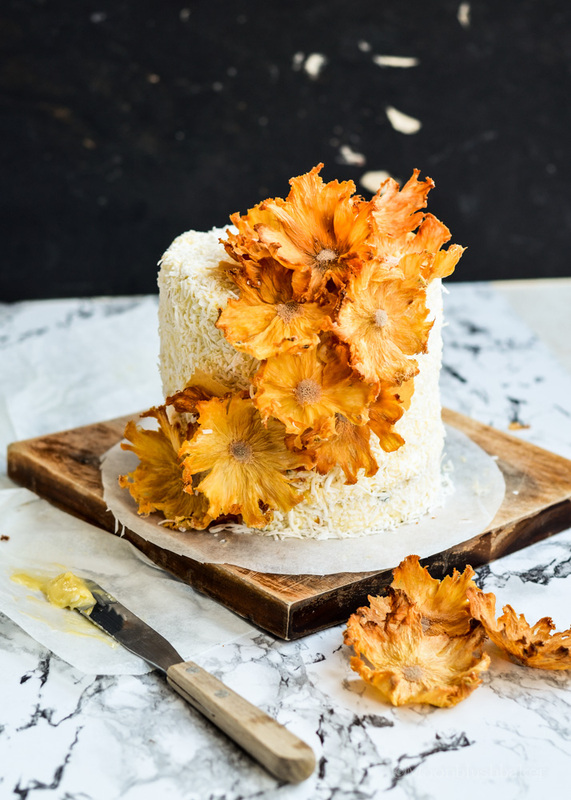 The layers of creamy coconut, smooth curd are contrasted by the crisp but chewy almond biscuit in the cake. I used passion fruit curd from the stores but you can make your own if you are feeling domestic. I am not going to lie; cakes like this one do take a gentle hand. Though it is all worth it if you can see a smile on someone’s face; especially when it is like my mum’s when she is genuinely happy. In a jug measure out your milk and whisk in vinegar. Set aside until needed. Grease and line 3 cake pan (15cm) with baking paper. Pre heat oven to 165C. Shift your flour, corn flour, baking powder, baking soda, and salt 3 times. In a large bowl using an electric mixer whisk the oil, syrup and sugar until the sugar is slightly dissolved. Add the extracts and whisk again for 3 minutes on high. It will not cream but become paler. Gentle mix in the flour and milk mix alternating as you go. Spread into your prepared tin, smoothing out the top with a spatula. Bake for 25-30 minutes or until skewer draws clean when inserted into the center. One whole pineapple, de skinned. Simple syrup (100g of sugar and 100ml water, bring to boil then cool) NOTE: keep extra in a glass Jar in the fridge, it is very useful in cakes! 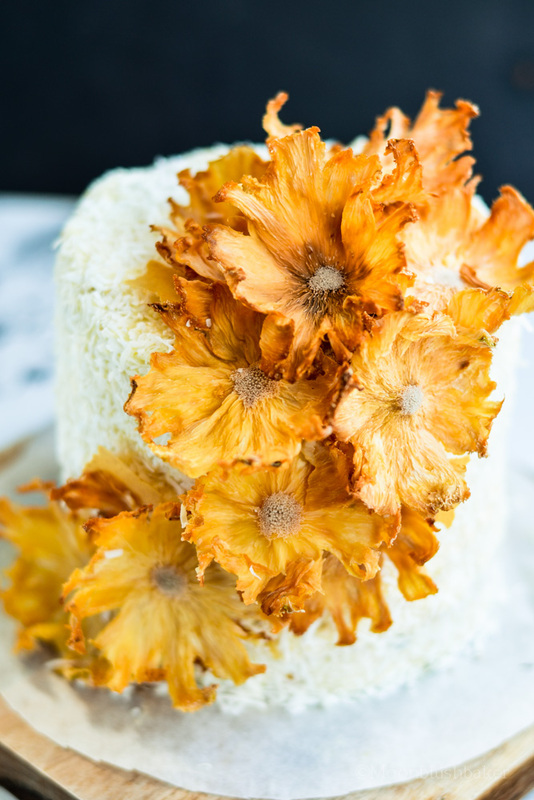 Make pineapple flowers: Preheat oven to 120°C. Place a Cooling rack over a large baking tray. Make sure the tray keeps the rack steady. Using a knife (chef knife), slice pineapple to 2mm-thick. Brush on sugar syrup to both sides of each pineapple slice.Place on wire rack. Dry in oven until slices are tacky to touch but still pale. This took 45 minutes for me but you should be able to lift each slice off the rack without tearing them. Flip them and dry for further 15 minutes. Remove from oven. Take a muffin tray and place each hole with a slice of pineapple from the par baked tray. This will create the flower shape. Return to the oven and turn it straight off! Leave in oven over night. 100g coconut butter, soften to room temp. Open cans. Scoop the top thick layer of fat off from the top and place in large bowl. Using an electric hand mixer, beat the cream and butter on medium. Turn down to low, while beating add in vanilla and icing sugar. Continue to beat until it reaches soft peaks. Set aside. With two large baking trays, line with both baking paper. Draw 2x15cm circles in pencil on one side of the baking paper and the turn it over. Place on one of the baking trays. Do the same with the other baking tray and baking paper. Place egg whites in a large bowl. Whip the egg whites to below soft peak. Add a teaspoon of caster sugar in to egg whites. Beat for another 30 seconds. Continue to do this process (one teaspoon of sugar then beat) until all of it is used. Turn the mixer on to high and beat until it is fluffy, smooth and glossy. Preheat oven to 150C. Bake the trays, one at time for 35 minutes until crispy. Leave on tray to cool. Set aside until ready. Place one cake layer on a piece of baking paper. Pipe a thin layer of coconut cream. Spread 2 tablespoons of curd in the middle of the cream. Place almond biscuit on top. Pipe on another layer of coconut cream. Place a cake on top. Repeat until all layers are used. Chill for 30 minutes to an hour. Spread cream along the sides of the cake, and refrigerate for 30 minutes. 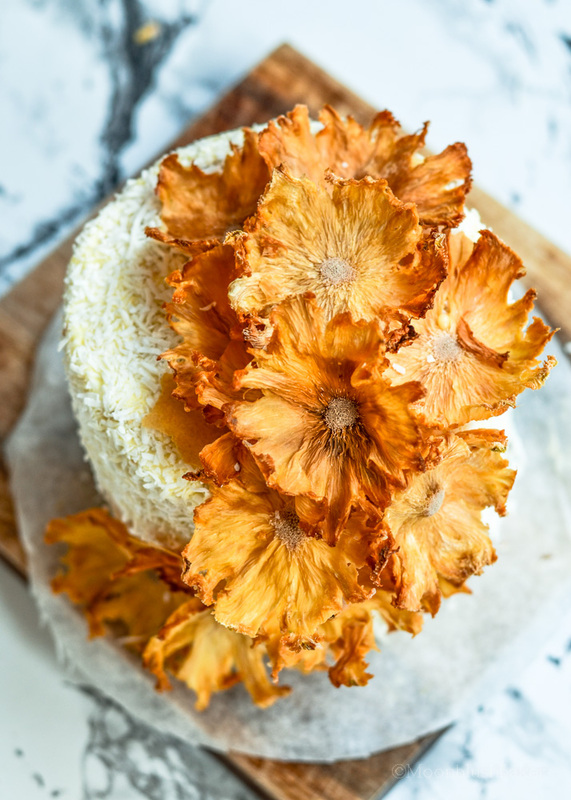 Lay desiccated coconut on a baking tray. 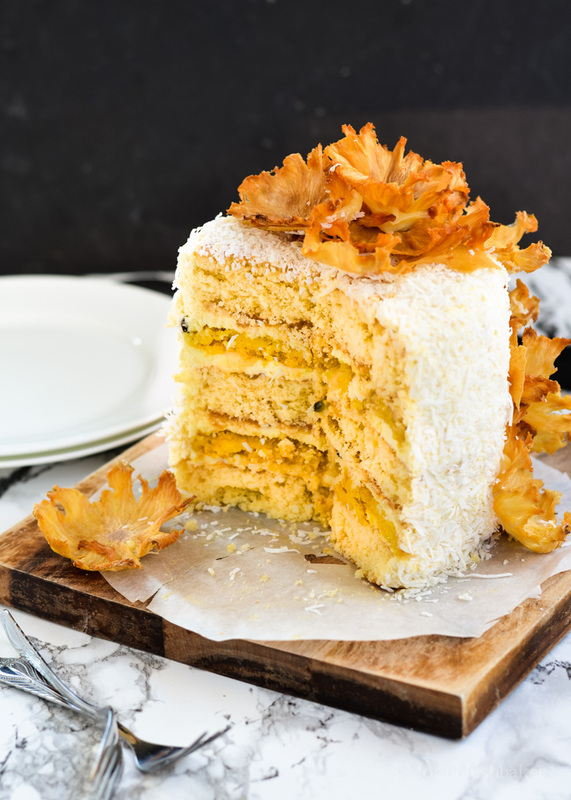 Roll side of cake in coconut. Place on plate. Spread top with cream and gently press in coconut. Set in fridge for 15 minutes. 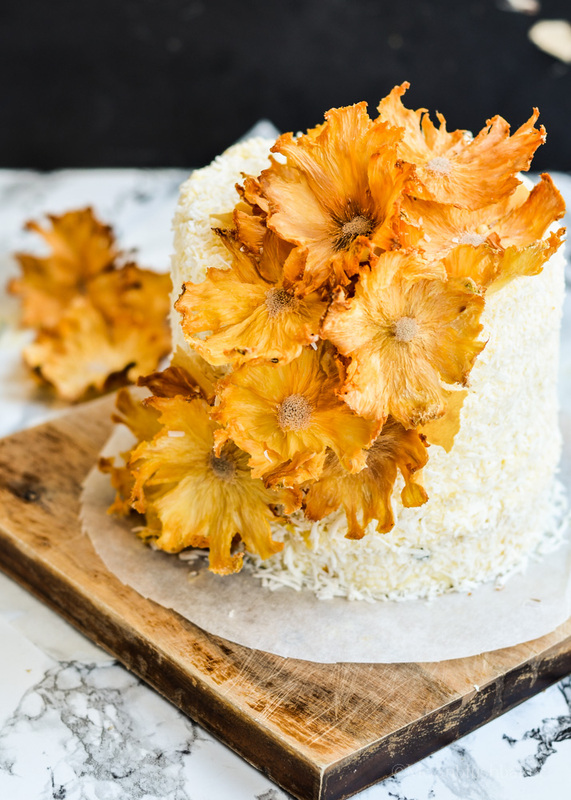 Place on pineapple flowers with extra cream. Serve. Wow! That cake of yours looks so exquisite, I'm torn between wanting to take a slice, or just stare at its beauty. I can't wait to try this out myself! Anyway, you're very lucky to have such an awesome mom. I hope she's in the best of health. Thanks for sharing! She is very happy to read your comment too Jason. Thank you for liking my cake so much but I really would like you take a slice if you could. Cake should be for eating! omg I didn't even know that pineapple has flowers! they're gorgeous! I'm trying very hard not to feel guilty right now because... I don't even know when my mom's b-day is! There. Worst daughter ever in this world... Can I still have a piece of cake? I have my iphone calender to thank for reminding me about it! The pineapple flowers are so cool when I first saw it, And of course you can! have a big piece! This is another of your amazing creations that grab me by my eyes and haul me in. Better than good pix (a major failing of mine). This cake must have made your mum very happy. Good on ya! All pictures by Moonblush baker. Powered by Blogger.